We may look different, but one thing will always remain the same – our dedication to helping New Zealanders get ahead, by making banking really easy. Every time, everywhere. We asked New Zealanders for feedback about us and we learnt it was time to make some changes - to be the bank you want and need us to be. It’s important we reflect not only who we are today, but where we’re going in the future. We wanted to reflect true New Zealand, so the faces you will see are the faces of our people and our customers. We wanted to capture the real life moments of everyday New Zealanders. Our promise of putting customers first remains at the heart of our philosophy and we’ll continue to provide award winning customer service and experiences. Over the last several decades TSB Bank has grown from the heart of Taranaki to a nationwide bank. We’ve been in business for 167 years and are proud to be 100% New Zealand owned and independent. Back in 1989 Taranaki Savings Bank changed its name to what you know us as today – TSB Bank. It’s been 28 years since then and we’ve grown a lot in that time. We continue to grow - with more branches, more customers and more ways to bank than ever before. We recognised however that our company and customer needs were changing and that it was time to make sure our brand was still relevant. Our brand conveys our identity, it allows people to differentiate us from other banks – it’s who we are, what we stand for and reflects our values. Although we knew we needed to make some changes, we first needed to do some research. So we reached out to a broad range of New Zealanders to find out what they had to say about us. They told us it was time for a change – to better reflect what we stand for and position us as a bank for all New Zealanders. From the outside looking in, we will look a bit different but we’re still the same bank you know. Over the next 12 months we will be transforming TSB Bank to TSB. Not everything you see will be updated, and there may be times when you see our history alongside our future. It was time to refresh our look to better reflect who we are today and we want to be in the future. Our new logo, name and colours are designed to reposition us as a truly national brand that appeals to all New Zealanders, including our existing loyal customers, while acknowledging our roots. 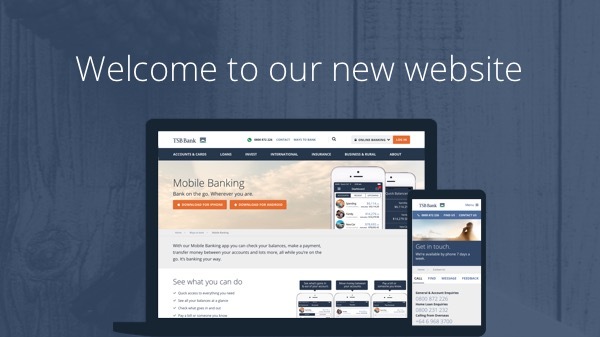 Our website, Online and Mobile Banking have all been given a fresh new look. You’ll still find everything in the same place and the way of doing things will remain unchanged. When visiting our website or sending us an email you may notice we’ve shortened to tsb.co.nz. All existing debit and credit cards will be replaced with the new designs upon reaching their expiry dates. If you’re eager to get a newly designed card prior to your current card expiring, or want to update your Eftpos card, you can request a new card either via your local branch, or by calling our Contact Centre. There will be a fee to replace any cards that have not expired or at special request. We’ve refreshed eight of our branches, with the remaining branches nationwide to be updated over the next 12 months. The look of the ATMs will be updated alongside the branches over the next 12 months. They will not only look different, but have also been updated recently to new touchscreen technology for easier use. We’ve changed to be the bank our customers and New Zealanders want and need. To reflect not only who we are today, but where we’re going in the future. While we now look different, not everything is changing. Putting customers first is as important to us today as it was when we opened our doors 167 years ago, and we’ll continue to provide award winning customer service and experiences. Let us know what you think of our change. We’d love to hear your thoughts. Hear from our CEO Kevin Murphy around our recent change. Have a question about our recent change? Check out our FAQs. Life changes. We'll be there.